Airport pick-up & hotel transfer. A paper sign with your name on will be held at the exit of the airport. Kunming is a hot China destination for its always pleasant climate and beautiful sceneries. Two sightseeing spots today. Qiongzhu Temple, built in the Tang Dynasty (618-907) is famous for the lifelike colorful clay figurines of the 500 Buddhist arhats. The Stone Forest, a typical karst topography, resembles a dense forest; lots of legends are about it. Fly to Dali; upon arrival, be picked up by the local guide and the driver. Dali, a unique cultural heritage, created by 25 ethnic groups as well as the picturesque natural landscape. We will explore this cutural site at Erhai Lake Park, Three Pagodas Temple and Dali Old Town. Have a 3 hours drive to our next stop in Yunnan-Lijiang. On the way, drop in at the Bai Traditional House where lives the Bai minority. It is an ancient village that still holds its charm: the roads paved with flagstones and the tranquil stream flowing in front of every house. Arrive in Lijiang and have a short rest in the hotel. 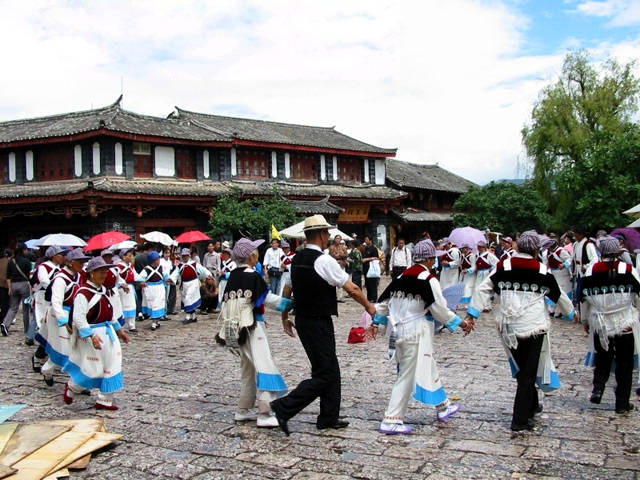 Continue our sightseeing at the Lijiang Old Town. There are numerous streets and crossroads as well as many ethnic flavor small shops along the streets; the streets can reach any corner of the old town, so take your time! Today, let’s discover the Nanxi minority culture. Visit the Baisha Village and a local family to feel the people’s easygoing life and enjoy local food; and the Baisha Murals in the Dabaoji Palace, vividly presenting the riligous tales and activities. Come to Yuhu Village at the Former Residence of Rock Joseph who is the one of the first westerners to spread the long-isolated Naxi culture worldwide. Afternoon free time to get around by yourself: the small bridges, swift streams, cobbled streets and the grey titled roofs of the residential houses. In the evening, watch the Naxi Ancient Music and Dance performance at Dongba Palace. Have our last day’s fun in this Lijiang trip. We will see the Yangtze River gorge-Tiger Leaping Gorge, and the First Bend of the Yangtze River, where Kublai Khan’s troops hiked 800 years ago. On the mountain at the bend stands the Stone Drum Town, a strategic military area where many famous historical events took place. Drive to Shangri-la and overnight at the hotel there. ‘Shangri-la’ in Tibetan culture refers to an ideal home that can only be found in heaven. The Shangri-la in reality is highlighted by scenic plateaus, and fascinating ethnic culture and Tibetan beliefs, seemingly ‘an Eden in dream’. Our visits include the Songzanlin Temple, Bitahai Lake, Shudu Lake and a lcal family drop-by. It is so exiting to be invited by the Tibetan family by the yak butter tea and the Tibetan dances. Fly to back to Kunming and have several tours there. Kunming, as the capital of Yunnan is celebrated as ‘City of Eternal Spring’ for its always pleasant climate as well as its natural scenery. The Golden Temple is a Taoist Temple, more like a palace, built on the top of the Mingfeng Hill in 1602; the closer you climb to the temple, the more peaceful you feel in the heart over the beauty of the hill. The Daguan Park is a picturesque lakeside park, and the Flower and Bird Market is an interesting place for a stroll and where you could buy some lovely souvenires home. Free time before departure. Send you off at the Kunming airport. Good luck! *China internal flights: Kunming-Dali, Shangri-la-Kunming.